The action of the hula ohe had some resemblance to one of the figures of the Virginia reel. The dancers, ranged in two parallel rows, moved forward with an accompaniment of gestures until the head of each row had reached the limit in that direction, and then, turning outward to right and left, countermarched in the same manner to the point of starting, and so continued to do. They kept step and timed their gestures and movements to the music of the bamboo nose-flute, the ohe. In a performance of this hula witnessed by an informant the chorus of dancers was composed entirely of girls, while the kumu operated the nose-flute and at the same time led the cantillation of the mele. This seemed an extraordinary statement, and the author challenged the possibility of a person blowing with the nose into a flute and at the same time uttering words with the mouth. The Hawaiian asserted, nevertheless, that the leader of the hula, the kumu, did accomplish these two functions; yet his answer did not remove doubt that they were accomplished jointly and at the same time. The author is inclined to think that the kumu performed the two actions alternately. The musical range of the nose-flute was very limited; it had but two or, at the most, three stops. 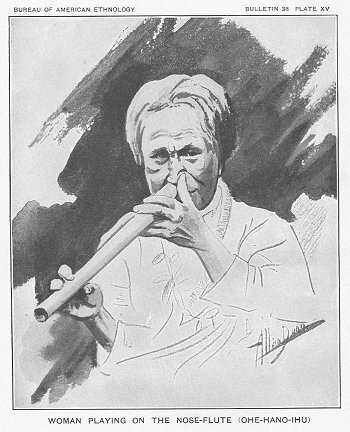 The player with his left hand held the flute to the nostril, at the same time applying a finger of the same hand to keep the other nostril closed. With the fingers of his right hand he operated the stops (pl. XV). E Kaili, c e Kaili, e! I ka wai kaili puuwai o ka makemake. 15 E he’e ana i ka nalu o Maka-iwa. Ua la’i oe no ke one o Ali-ó. 20 Aia ka ipo i ka nahele. On the surge that enthralls the desire. Your love is up here in the wildwood. This mele hoipoipo, love-song, like the one previously given, is from Kauai. The proper names that abound in it, whether of places, of persons, or of winds, seem to have been mostly of Kauaian origin, furnished by its topography, its myths and legends. They have, however, become the common property of the whole group through having been interwoven in the national songs that pass current from island to island. 135:a Ida-wai-kini. The name of a rocky bluff that stands on the side of Mount Wai-ale-ale, looking to Wailua. It is said to divide the flow from the great morass, the natural reservoir formed by the hollow at the top of the mountain, turning a part of it in the direction of Wai-niha, a valley not far from Hanalei, which otherwise would, it is said by Hawaiians, go to swell the stream that forms the Wailua river. This rock, in the old times, was regarded as a demigod, a kupua, and had a lover who resided in Wai-lua, also another who resided in the mountains. The words in the first two or three verses may be taken as if they were the utterance of this Wai-lua lover, saying "I will go up and see my sweetheart Ida-wai-kini." 135:b Pihana-ka-lani. Literally, the fullness of heaven. This was a forest largely of lehua that covered the mountain slope below Ka-wai-kini. It seems as if the purpose of its mention was to represent the beauties and charms of the human body. In this romantic region lived the famous mythological princes--alii kupua the Hawaiians called them--p. 136 named Kaua-kahi-alii and Aiwohi-kupua, with their princess sister Ka-hale-lehua. The second name mentioned was the one who married the famous heroine of the romantic story of Laie-i-ka-wai. 136:a Manu hulu ma’ema’e. An allusion to the great number of plumage birds that were reputed to be found in this place. 136:c Kaili. The full form is said to be Ka-ili-lau-o-he-koa--Skin-like-the-leaf-of-the-koa. In the text of the mele this name is analyzed into its parts and written as if the phrase at the end were an appellative and not an integral part of the name itself. This was a mythical character of unusual beauty, a person of superhuman power, kupua, a mistress of the art of surf-riding, which passion she indulged in the waters about Wai-lua. 136:d Hooipo-i-ha-Malanai. A mythical princess of Wailua, the grandmother of Kaili. This oft-quoted phrase, literally meaning to make love in the (gently-blowing) trade-wind, has become almost a stock expression, standing for romantic love, or love-making. 136:e Lehua-wehe. The piece of ocean near the mouth of the Wailua river in which Kaili indulged her passion for surf-riding. That is riding the surf of Maka-iwa. would not only make a possible, but a poetic, picture. 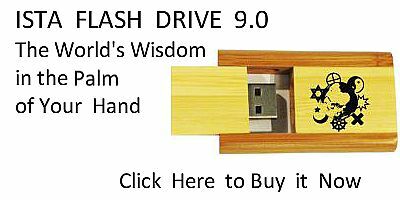 Let the critical reader judge which of these two versions hits closer to common sense and probability.